If one thing is true about buying a new camera for an upcoming trip, it's that there are plenty of choices. However, deciding among them can be overwhelming. 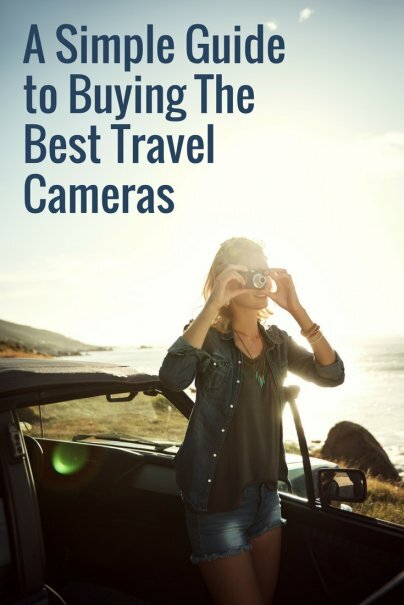 The camera market is more than saturated and it can be hard to figure out which one of the available options is right for you and your travel style. One of the most important things to keep in mind is that the "best" camera is the one that will serve your needs best. Do you want to be able to use it underwater? Do you want to be able to take more professional looking photos by choosing settings manually? Deciding what factors are most important to you before you shop will help ensure that you pick a camera that is the best match for your needs. Any active traveler knows that the tougher a camera is, the better. Chances are, your camera could be subjected to rain, snow, seawater, and lots of bumping around while you're climbing, sailing, diving, skiing, or just strolling around town. You need a rugged camera that can accompany you through it all. The newest addition to Olympus' Tough lineup, the TG-5, is currently available for pre-order and will soon hit the mass market. Priced at $450, you can drop this tough point-and-shoot from heights of up to seven feet, subject it to temperatures as low as 14 degrees Fahrenheit, and dive with it to depths of 50 feet. It's also dustproof and crushproof. This rugged camera can survive pretty much any condition you subject it to, and still take great pictures. It renders colors vibrantly and includes art filters if you want an easy way to add Instagram-like effects to your photos. If you prefer to do more in-depth post-processing, the TG-5 also shoots stills in RAW mode. It shoots stunning video in Ultra HD 4K. Pros: In addition to its durability, this camera can fit into your pocket easily (it measures 4.4 inches by 2.6 inches by 1.2 inches). It's also lightweight at just over half a pound. Cons: As a point-and-shoot camera, the TG-5 has no manual mode. If you intend to only use your camera in automatic modes, then this isn't really a downside. GoPros are excellent and durable cameras that allow you to take action photos and videos from a unique point of view. You can take GoPros on the ski slopes, to the sea, mountain biking, parasailing, and just about anywhere else without ever having to worry about damaging them. Their durability is one big draw, but users also praise their wide angle lenses, which allow you to capture more in one frame than a traditional camera. The easy mounts you can buy to accompany a GoPro allow you to shoot from your arm, a helmet, a bike, and so much more. These mounts secure the camera so you don't have to worry about losing it. You can focus on what you're doing while simultaneously preserving that moment for future viewing. The Hero5 Black, the latest model, retails for about $400. Pros: GoPros are great for extreme sports, but even the not-so-extreme traveler can benefit by using them to catch hands-free footage on the go. The body of the Hero5 Black is waterproof up to depths of 33 feet, meaning you no longer need a special casing to keep moisture out. You can shoot in 4K Ultra HD, and change settings with the touch-screen or by using voice commands. The Hero5 also features GPS, stereo audio, electronic image stabilization, and the ability to upload clips automatically to the cloud. Cons: If you're going to be taking a lot of portraits or wildlife close-ups, a GoPro is probably not for you. The wide angle lens gives an immersive feeling to action shots, but also creates barrel distortion. The Hero5 comes with a linear field of view setting that allows you to shoot in a mode that corrects some of that distortion, but it's still not perfect. GoPro colors can also be a little flat. You can use the ProTune feature to help increase saturation a bit, but without some postproduction editing, you may be disappointed with the vibrancy of your images. One final thing to keep in mind is that the battery life of GoPros is notoriously short, lasting only about an hour-and-a-half when you're using the camera's GPS, electronic image stabilization, and Wi-Fi. You may want to purchase a backup battery, which costs around $20. Digital photography pretty much spelled the death of Polaroid cameras and their instant-print ilk. Or so it seemed. These cameras have recently been staging a comeback, and some of them are small enough to be excellent for traveling. They allow you to instantly and effortlessly share your favorite shots with new friends that you've made on the go. The Fujifilm Instax Mini 8 is 4.6 inches by 4.7 inches by 2.7 inches, weighing 11 ounces before adding the batteries. That's not tiny, but it's smaller than some competing cameras. I prefer the Fujifilm brand because in my opinion, its cameras are more comfortable to hold and I've always liked Fujifilm's standard color grading in photos. The Instax Mini 8 sells for about $60. You'll need to buy the Instax Mini film made specifically for these cameras. Pros: The retro touch and the ability to get prints on the spot make these cameras instant fun. Want to make friends with locals wherever you go? Ask nicely to take their photo, then give them a copy from your Instax Mini. Kids especially appreciate the gift. You can also use the photos as souvenirs for yourself, or postcards for folks back home. Cons: The image quality of the Instax Mini 8 doesn't match even most cellphone cameras, so don't buy it to capture beautiful landscapes. It's more of a fun, retro snapshot device. Another drawback is that instant film is notoriously expensive, so be prepared to spend around $13 for a twin-pack (10 exposures on each film cartridge). You'll want to stock up before you leave home, because you'd be surprised how fast you can go through 10 shots — especially if you're used to shooting pictures digitally. You'll also need a scanner if you plan to upload your snapshots online. If you want more control over your camera, you'll need a digital single-lens reflex (DSLR) camera with a manual mode, so you can adjust the shutter speed, aperture, and ISO according to the light conditions and the elements you want to emphasize in your shot. Canon's Rebel line of cameras are perfect entry-level DSLRs for travelers. They allow you to easily move between automatic and manual modes, giving you full control or easy point-and-shoot capability, depending on your mood and situation. This camera is easy to use and won't take up too much space, yet allows you to move closer to professional photography capabilities. The T6i boasts a 24.2 MP sensor for beautiful high-resolution shots, and a quick, accurate autofocus. The 3-inch touch-screen is fully articulating, making it perfect for vloggers who need to be the focus of their own shots. This particular model of Canon Rebel frequently finds itself on the list of best DSLR cameras and it's my favorite of the DSLR class 24 MP+ category. Pros: Automatic modes make it easier to shoot near-pro quality images and video even if you haven't fully mastered shooting in manual yet. Additionally, this model includes a very handy wireless transfer capability that enables you to sync pictures from the camera directly to your phone or computer, so you can easily publish on the go. Canon's Rebel cameras are typically sold with a starter lens, and this one comes packaged with a EF-S 18-55mm f/3.5-5.6 IS STM. In layman's terms, this lens has a great range of wide-angle through medium telephoto, image stabilization for sharper photos, and the stepping motor (STM) keeps autofocus smooth and quiet during video. Cons: Weighing in at 18 ounces, this camera is one of the bigger and heavier ones we've included in this list, although it is still very portable. Its dimensions in inches are 5.10 by 3.93 by 3.07, and it costs about $670. If your main intention is video blogging, then the best vlogging camera currently on the market should be your choice. You really can't beat this compact $679 camera for video. It's small enough to fit into a backpack pocket (4.2 inches by 2.4 inches by 1.7 inches, and weighing 11.2 ounces), which is nice for those who require some level of portability while traveling. It has a flip-up selfie screen for those perfect vlogging shots or selfie stills, and with its 1-inch image sensor it takes pretty nice photos, too. Pros: Selfie flip-up screen. Beautiful colors. You can shoot images in RAW mode for in-depth editing in Lightroom or Photoshop, which is a feature still lacking in many compacts. Cons: Barely pocketable. If they made it just a half inch narrower, this thing would slide in and out of your pants pocket with ease. The biggest con about the G7 X Mark II is the fact that there is no external mic port, which is a huge disadvantage for people who are serious about taking professional videos. Unfortunately, none of the best cameras in this class have an external mic port.